FENGJING, Shanghai: London Taxis are as British as bowler hats and the Big Ben. But the latest models coming off the new assembly line are unlikely to ever touch an English road. At a sprawling factory in the lush green suburbs of Shanghai, young workers are gearing up for full-scale production of black cabs, one of Britain's most iconic vehicles. It's part of an alliance that aims to give the distinctive black cab a greater presence outside its namesake city. London Taxi International (LTI), which will continue to build nine out of 10 cabs used in Britain at a factory in Coventry, couldn't increase production at its small-scale, high-cost plant. So it turned to a partner - and to China - as a way to drive overseas expansion. "To say the writing was on the wall would be pushing it a bit too far. But you do need to make progress within the automotive industry," says Paul Stowe. Stowe is a British auto executive overseeing the joint venture between Britain's Manganese Bronze Holdings PLC, owner of LTI, and Geely Group Holdings, one of China's biggest independent automakers. The venture is bearing fruit already, Stowe says, with agreements signed to sell 6,000 London Taxis from the Chinese factory, more than double the Coventry plant's annual output. Most will go to cities outside China - places like Singapore, Dubai, Moscow - that covet the image associated with the London Taxis' tradition of good service and durability. Since the black cabs demand a higher price, they are unlikely to displace other vehicles used as taxis in China. The LTI expects to sell them mostly to hotels, limousine services, airports and individuals who might want to collect one, Stowe says. Manganese Bronze Holdings hunted for nearly a decade for a suitable Chinese partner. Geely likewise was looking for a chance to bring onboard the new technology and quality upgrades it needs to get ahead in China's brutally competitive market, without risking being swallowed by a huge international rival. "We were the right size and available at the right time. It works well for both companies," Stowe says. 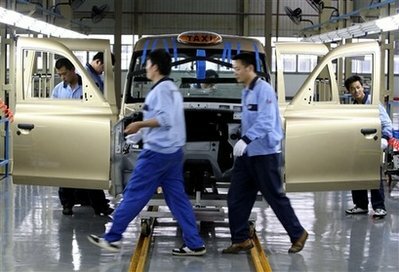 Trial production of the London Taxi's TX4, equipped with 2.4-liter Mitsubishi engines, began last week in Geely's sprawling Shanghai Maple factory in the scenic canal town of Fengjing. The plant will start mass production by mid-December. By increasing production, the LTI expects to reduce costs by up to 60 percent, with most of the savings coming not from cheaper labor but from less costly parts, Stowe says. The price for the vehicles has not been disclosed, but it will be significantly cheaper than the British-made models that sell for about 30,000 pounds ($54,000), says Stowe who, as deputy general manager of Shanghai LTI Automobile, is busy plotting the venture's brand strategy. "Classical British Icon with Traditional Chinese Spirit," reads one of the many slogans in the factory. Unlike most highly automated modern auto plants, there are few robots because the London Taxi is hand-built and hand-welded. The result is a heavy-duty, durable vehicle that can be driven 1.6 million km and last several decades. But it's the vehicle's traditional idiosyncrasies, such as its famed ability to make extremely tight turns, and the storage space next to the driver's seat that originally held hay bales in the days of horse and carriage, that give the black cab its appeal as "not just another car", Stowe says. Black cabs - which these days often come in other colors and are festooned with advertising - are seen strictly as a commercial vehicle in Britain. But in China, the vehicle's novelty, and notoriety from appearances in dozens of films, lends it a certain cachet.